German Giant, one of the biggest bunnies on the face of the planet, tips the scales at 17 pounds — almost seven pounds more than the average rabbit of his breed. And he’s still growing, according to German breeder Hans Wagner (above), whose hair-raising angora hare was the highlight of a recent rabbit fair in Berlin. 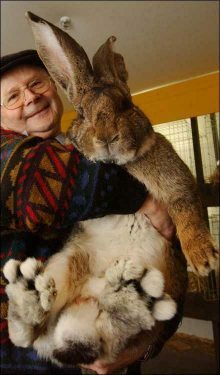 On all paws, German Giant, named for the world’s largest rabbit breed, stands 17 inches tall. And standing on his hind feet, he’s more than three feet tall. To find out how unusual Wagner’s wabbit is, The Post contacted Six Bells Rabbitry in Arvada, Colo.
How did German Giant get so big?